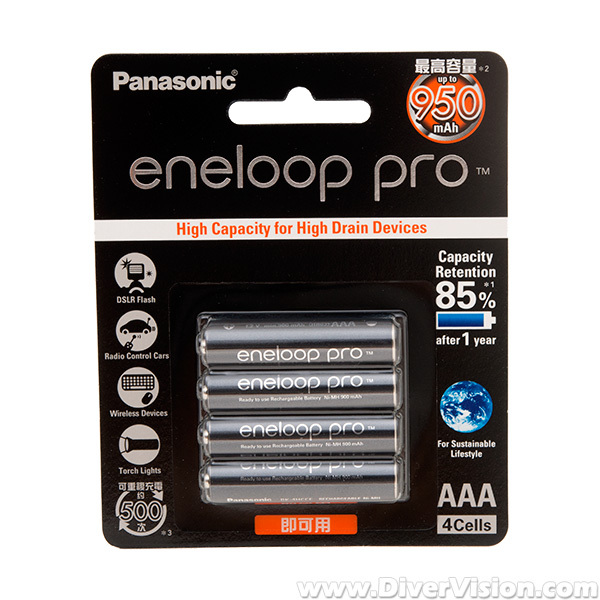 Panasonic Eneloop Pro AAA NiMH 950mAh Pre-Charged Rechargeable Battery Pack of 4 are high capacity pre-charged rechargeable batteries ideal for all uses and benefit from the unique features of Eneloop. Eneloop pre-charged rechargeable batteries have been continuously developed since their launch in 2005. The high power Pro range features up to 500 charge cycles, retains up to 85% of their charge after 1 year and are pre-charged in Japan using solar energy making them our greenest high capacity rechargeable battery! Pre-charged Nickel Metal Hydride (NiMH) batteries are the latest in rechargeable battery technology. They provide superior performance, can be recharged hundreds of times, come ready to use straight from the pack and are suitable for all devices and uses. Rechargeable batteries are great for the environment, they save you money and reduce waste by replacing hundreds of standard Alkaline batteries!